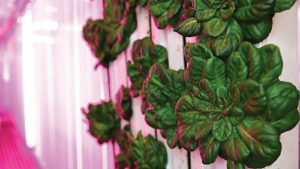 Behind the closed doors of the nondescript trailer in a city parking lot, leafy lettuces and bushy herbs sprout from vertical rows of gutter-like panels. The plants are fed nutrient-rich water while dangling strands of blue and red LED lights bathe them in an otherworldly pink glow. LED lights inside the Freight Farm cast a pink glow that mimics sunlight. There is no tractor. No barn. Not even soil. Yet by any definition this is a farm, one that will yield a harvest year-round, regardless of the season. The agricultural operation requires no special skills — just a willingness to embrace technology, and an awareness that a food source existing right outside your door is a pathway toward individual health and collective sustainability. It’s called a Freight Farm, and it’s agronomy for a new age. Freight Farms is a blooming business with roots at Clark University. Six years ago, co-founders Brad McNamara, M.B.A./ES &P ’13, and Jon Friedman prototyped a hydroponics farm, which they dubbed the Leafy Green Machine, in the parking lot behind Clark’s Recycling Center. Their goal was to create local, mobile food economies by marrying environmentalism with entrepreneurial vision under the philosophy that sustainability is not a side line, it’s the bottom line. Today, Freight Farms supplies 40-foot shipping containers retrofitted to grow vegetables and herbs in any location and climate. The company has sold more than 50 rigs across North America, most of them to customers with no farming experience but who see the value of a steady supply of fresh, readily accessible produce for their restaurants, college campuses, hospitals and food-themed start-ups. Google’s campus in Mountain View, Calif., feeds its employees from a Leafy Green Machine. Greens sprout in “growing towers” inside the container. They are also using social media to form virtual farming communities. Rather than meeting at the Grange to talk shop, folks log on to Freight Farms’ private Facebook group to learn how others have handled challenges or achieved success from growing crops in a container. McNamara wants his farmers to feel freed up by their farms, not restricted. 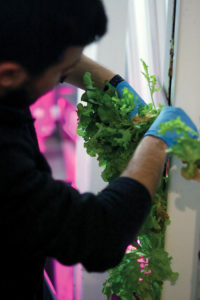 Headquartered on the edge of Boston’s Seaport District, Freight Farms features an on-site container that is a living lab where staffers conduct research on crops and yields, then relay that information to farmers, according to Caroline Katsiroubas, the company’s community manager. Potential farmers participate in a two-day “farm camp” to learn how to operate the system. Green thumbs aren’t required. “Motivation is the number-one skill needed to grow their own food,” Katsiroubas says. Even before he arrived at Clark to pursue dual master’s degrees in business and environmental science, McNamara had been experimenting with growing vegetables. Both he and Friedman had done consulting around rooftop greenhouse development and also were intrigued by hydroponics. McNamara notes that farmers have long figured out how to make do with available resources, finding what works in the face of unpredictable weather, pest infestations and a host of other obstacles. “When you give farmers a piece of equipment, they will get every ounce of value out of that equipment,” he says. McNamara and Friedman launched a successful Kickstarter campaign to purchase a shipping container. They worked with Jenny Isler, Clark’s director of sustainability, who offered resources, advice and encouragement, and brought in student Eco-reps as volunteers. She also made the key donation of a parking spot on Maywood Street, behind the Recycling Center, to provide a home for that first container. Few knew that the two men entering and exiting the trailer were building a new model for automated agriculture. The business partners spent six months building, dismantling and rebuilding at least five different versions of a Leafy Green Machine — “We tried every configuration,” recalls McNamara — before perfecting the systems and structures that evolved into Freight Farms. Among their earliest customers was Clark’s student-run food co-op, The Local Root. How does a Freight Farm work? A Freight Farm can be monitored remotely. Seeds are planted in peat moss “grow plugs,” and as they bud they are transplanted into recycled plastic mesh that is inserted into the growing towers. The towers are hung from hooks connected to a system that continually recirculates water. A high-efficiency LED lighting system mimics sunlight. Hydroponics in itself is not new, but Freight Farms is wired for the 21st century. Environmental sensors balance temperature, humidity and carbon dioxide levels. With an internet connection users can monitor their operation anywhere in the world via computer. 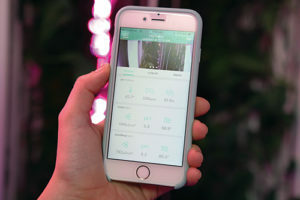 An iOS app makes it possible to adjust all the farm’s environmental components remotely. As many as 7,500 plants can be grown in the 320 square feet of space in a Freight Farms trailer. According to the company, a Leafy Green Machine will produce the equivalent yield of an acre of farmland while using 90 percent less water and no pesticides. All farmers begin growing with a standard protocol, making adjustments as their operation advances. That flexibility is key. Once a farmer has established a system, crops are staggered for a consistent harvest. Freight Farms has come full circle at Clark University. The scruffy two-man startup, which is now a thriving enterprise of 17 employees and counting, has reestablished its presence on campus. On January 15, the University, in partnership with its Dining Services vendor Sodexo, received delivery of a Leafy Green Machine behind the Lasry Center for Bioscience. The farm provides Clark with fresh lettuce — about the most widely consumed vegetable at the University — whether two feet of snow blankets the ground or the thermometer hits three digits. Eventually, other plants like chives, basil and cilantro may be incorporated into the mix, according to Michael Newmark, general manager of Dining Services. Other options can include leafy greens like kale, cabbage and Swiss chard; and herbs like mint and oregano. Nick Pagan ’15, pictured in the Clark cafeteria, holds a basket of lettuce he harvested from the university’s Freight Farm. Clark’s interest in Freight Farms is about more than McNamara’s involvement. In 2013 the University signed onto the Real Food Challenge, committing to use 20 percent “real food” — food that is local/community-based, and ecologically and humanely raised — by 2020. New England’s seasonal variations mean Clark can’t just order the 500 heads of lettuce it requires every week from local growers, Isler says. The new Freight Farm, which Clark has leased for eight months, will likely go through one or two crop rotations to see if it’s suitable for a long-term investment, she notes. Freight Farm production at Clark serves many purposes, including as a learning lab that demonstrates food can be grown in places otherwise inhospitable to farming. Once the Leafy Green Machine was made operational, graduate students Kamalan Chandran, M.S.I.T. ’16, and Rebecca Miller ’15, ES&P ’16, tended the plants daily and harvested the lettuce weekly. Coincidentally, Miller worked with McNamara and Friedman on the early Freight Farms prototype when she was an undergraduate. Jon Olinto, co-owner of B.GOOD restaurants, formed a partnership with the owner of a Leafy Green Machine to have kale at his Boston locations during the colder months. 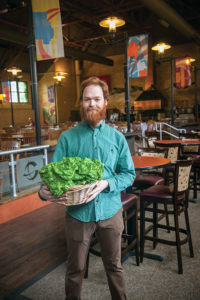 In the summer, the restaurant will turn to traditional farmers for kale, but he hopes to use the hydroponics space for more delicate and less common greens like mache. McNamara expects to see Freight Farms growers begin disrupting food distribution patterns. As he sees it, local distributors can rely less on what the larger food brokers offer, and now have the flexibility to develop specific relationships with farmers based on needs and demands.